Bridgeport Paving Co., Inc has been providing a host of paving services for over 40 years. We are a family owned and operated business that specializes in all phases of residential and commercial site construction including: asphalt paving, concrete work, excavation, drainage, utility and general contracting work. 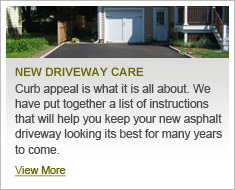 Your next paving project should be seamless and affordable. At Bridgeport Paving we understand that this business is all about people — about how we can meet the unique needs of our clients and community. Every project taken on by us is built from exceptional service and quality, all at affordable pricing. We go above and beyond to meet or exceed our clients' expectations — a peace of mind that comes standard at Bridgeport Paving. Set your mind at ease with your next paving project. Let the experts at Bridgeport Paving explain how they can provide you with a new, durable and quality asphalt or concrete pavement job at cost effective pricing. Expert assistance is just a call away.